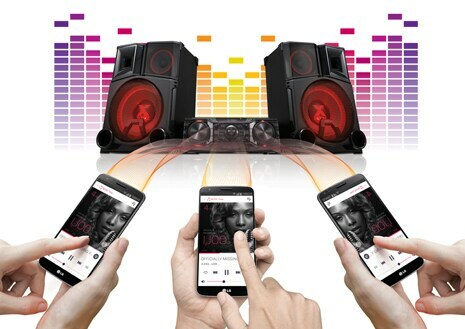 Automatically synch and play music from your smart phone or tablet just by standing close to your LG Hi-Fi System. LG Range-of-FlowTM technology uses Bluetooth to detect where you are and can automatically transition playback from your mobile device to the system just by standing near the system. 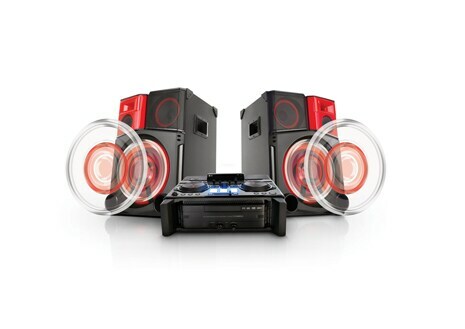 Play your party anthems in 4400 W output. With such a powerful sound, Everyone will feel get in the grove. Let your party go Wild. This system has the ability to connect mutiple (up to 3) Bluetooth devices simultaniously. Control from three different devices or let your friends also send music to the System. Indeed, a great party always becomes better when everyone chips in. LG Music Flow Bluetooth Application makes accessing music from your phone easy. Pick what you want to listen to or let the app do the work based on your mood. 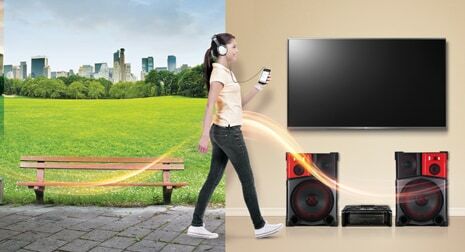 Simply connect your LG audio system to your LG TV and enjoy powerful sound wirelessly via Bluetooth®. Want to double the fun? Simply connect two Identical systems together with the unique X-Boom feature and double your system sound and power. Allows simple “tag and go” pairing between system and compatible Bluetooth devices like Smart Phones and tablets.